UFUWare Windows 10 3D Converter is the professional 3D converting software for Windows 10 which has functions of converting 3D to 2D, converting 2D to 3D and converting 3D to 3D on Windows 10 pc. 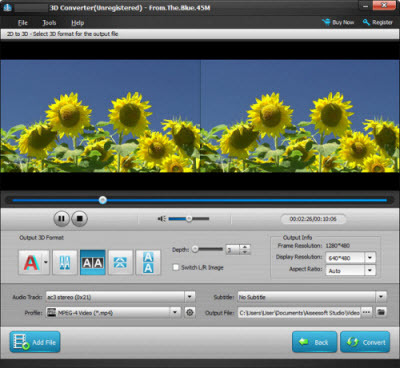 It empowers you to convert 2D videos to 3D effect, to convert between 3D formats and to convert a 3D video to 2D effect. Step 1. Download and install UFUWare 3D Converter for Windows 10 on your computer. Step 2. Click 2D to 3D, you come to the 2D to 3D converting panel. Hit Add File and choose the 2D videos you want to convert on Windows 10. Step 3. We provide 5 3D modes like Anaglyph, Side by Side, Side by Side (half-width), Top and Bottom, or Top and Bottom (half-height) for you to choose. Select the one that suits best for your player and 3D glasses. Adjust the depth to your satisfaction. Step 4. Choose your favorite Audio Track and Subtitle, or No Audio or No Subtitle. Step 5. Define the output format and destination by choosing from Profile and Output File separately. Then click the Convert button to start the 2D to 3D conversion on Windows 10. UFUWare Windows 10 3D Converter has the great function of converting 2D video to 3D video on Windows 10 pc. Almost any video format is supported, for example, mpg, mpeg, mp4, rm, rmvb, ts, mov, webm, wma, avi etc. It also highly supports HD videos, such as ts, m2ts, trp, tp etc. Meanwhile, this converter software is designed with several output 3D formats for you to choose, including Red/cyan anaglyph, side by side full or half width, top and bottom full or half height. UFUWare 3D Video Converter for Windows 10 allows you to change the 3D format of the original 3D video on Windows 10 pc. It offers several output 3D formats for you to choose, including Red/cyan anaglyph, side by side full or half width, top and bottom full or half height. Meanwhile, the positions of the right and left image are also changeable. If the 3D video you downloaded or bought is not compatible with your 3D player or 3D glasses, you could convert it to the suitable format and enjoy it over again. Also, the 3D converter provides different profiles, making it possible to play 3D on portable devices. Many people choose to watch 2D videos instead of 3D in consideration of convenience. They are not used to wearing glasses while watching movie. However, nowadays many hot movies are 3D movies, providing brilliant visual effect yet causing much trouble. UFUWare Windows 10 3D Converter acts as troubleshooter again. It enables you to convert the 3D video to a common 2D video on Windows 10. Red/cyan, side by side, top and bottom, 3D videos of virtually all formats are convertible. You are also allowed to fulfill the conversion by choosing the left-eye or right-eye image. Meanwhile, it provides different profiles for you to choose. Therefore, it becomes possible for you to watch 3D videos in 2D format on your iPad, iPhone, PSP, mobile phone or other portable media players. The Windows 10 3D Converter provides users with multiple converting features and high converting quality at ultra-fast rate. It provides many options for you to choose, not only refers to the profile, but also the adjustable effect, the length, audio tracks and even subtitles. The 3D Video Converter for Windows 10 is specially designed for common users, so the operation is simple enough for everyone. Just a few clicks can help you finish the whole conversion. How to Create 3D Movies for VR with Ultimate VR Converter?